Improve your communications and text-enable your business phone numbers with MessagePro Office. Your team can send, view, and reply from their PCs. You can virtually instant set up both local and 800 numbers—get new numbers or use the numbers you already have. Take advantage of the growing popularity of text messaging, read for 95% of people who receive it and proven to drive more inquiries and inbound calls or texts. Instantly search all messages for key information and full logging for compliance. We initially used MessagePro Office for simple reminders to clients for routine items. However, we have also found it to be very effective for business development. By far, the biggest payoff is increasing the efficiency and morale of our employees—making outbound calls that were not answered, well, it’s hard to stay motivated. 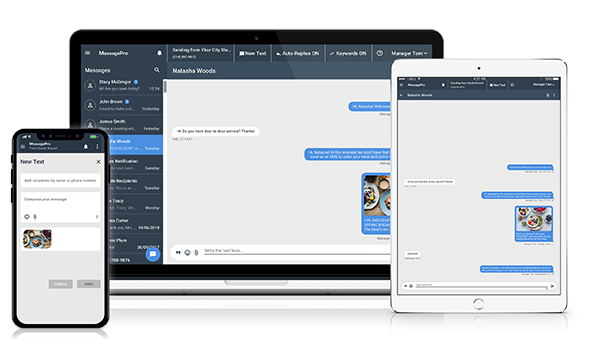 MessagePro Office texting services almost totally changes the game—we know that texting has a multiplying effect on our communications productivity. Want to Know More About MessagePro for Financial Services? Let’s Talk!